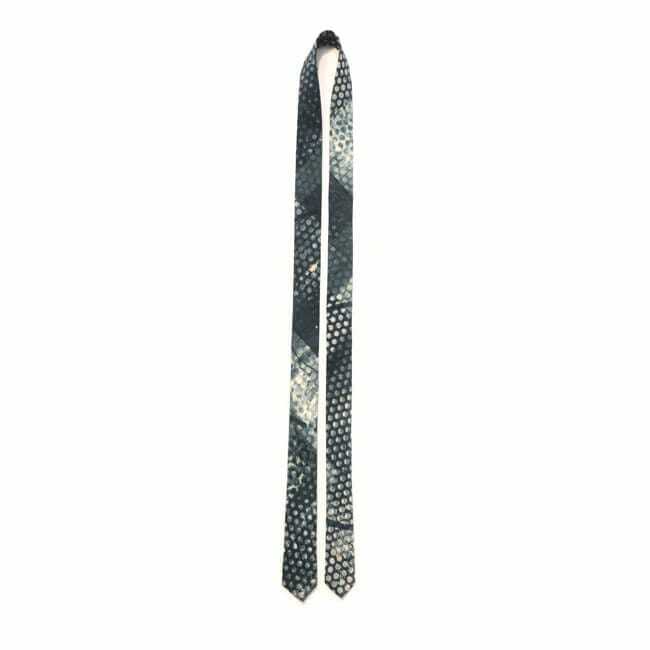 Stylish silk tie in a dotted design. This luxury silk tie (skinny width) adds a pop of colour and flair to a gentleman’s outfit. Each tie is printed by overlaying pattern pieces in different ways to create neck accessories which are all unique. 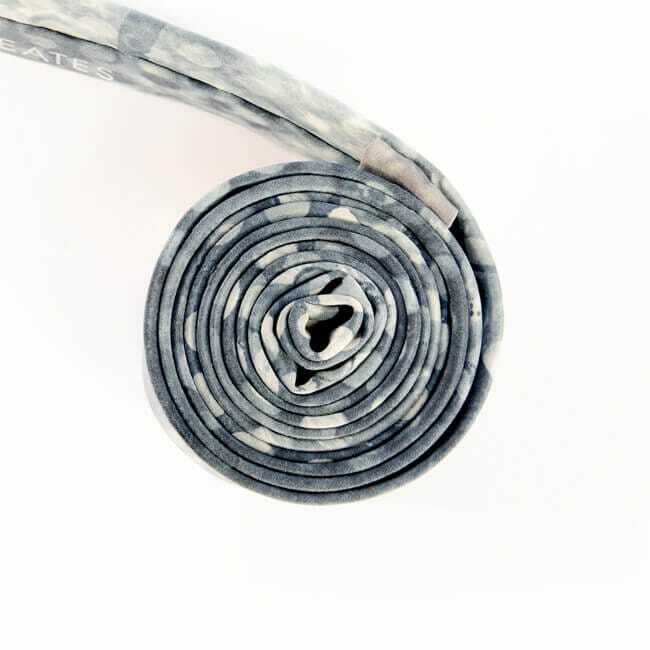 This tie is cut in a skinny width but is also available in a regular width version. 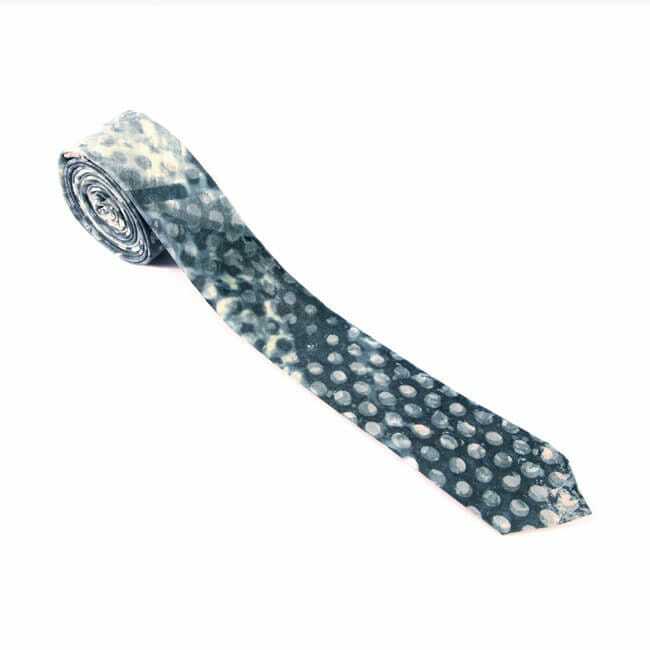 This dotted pattern tie, seen here in blue, can be made to order in a variety of colourways. Matching pocket squares and cufflinks also available. Textile artist Emma Noble comes from a background of fine art printmaking. She studied at Gray's School of Art in Aberdeen before returning to her hometown in the Scottish Highlands where she set up her studio in 2008. Emma now works with textiles, primarily silk, to create a range of hand-printed artisan accessories for men and women. Emma carefully hand-dyes the silk before printing a combination of pattern elements using screenprint and discharge techniques. Using multiple screens and overlaying elements, Emma creates a collection of wearable accessories which are similar in style but unique in design. Creating her accessories entirely in-house allows a continuity of production and the flexibility to create truly one-of-a-kind pieces. Drawing on textures from architectural and built surfaces, Emma is interested in the way that nature interacts with, and weathers, these surfaces. Through the layering of pattern elements, Emma creates complex, sophisticated designs which balance the fusion of natural and manmade. The colourways suggest the aqua of the sea, the blue of the sky, and the copper tones of the heathery ground found throughout the Highlands. Working on the silk as if it were a canvas, Emma builds up the layers in quite an experimental way, allowing the print process to inform the final design. She loves to explore the variety of combinations and subtle variations which can be achieved while using a small number of pattern pieces. The merging of printed layers and discharge (bleaching agent) creates some exciting and beautiful details which she contrasts with smooth areas of hand-dyed colour.